The Italian training ship AMERIGO VESPUCCI was built at the shipyard of Castellamare di Stabia in 1930. The type of ship was similar to the large frigates of the 19th century. Since her launch the ship has been used for training of cadets in the naval academy. She was named after the Florentian Amerigo Vespucci, who undertook four discovery journeys to South America from 1497 to 1504. The figurehead of the ship is an image of him. In Wikipedia there are two articles on the explorer and cartographer Amerigo Vespucci and on the AMERIGO VESPUCCI ship. 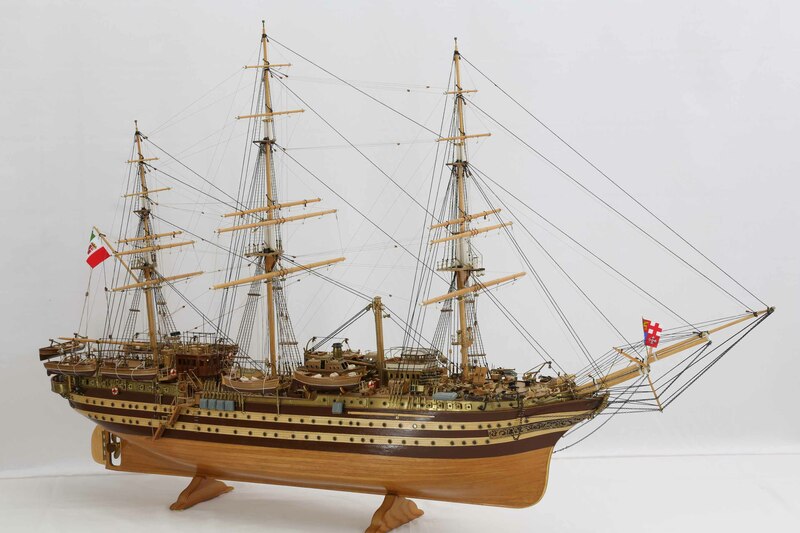 This model of the AMERIGO VESPUCCI is a very beautiful piece of work. The ship model was built without sails to allow for a better view on the impressive rigging. The details of hull and equipment are finely worked out. The ship model is 1 : 84 scale. Length is 127 cm, width 38 cm, height 79 cm.